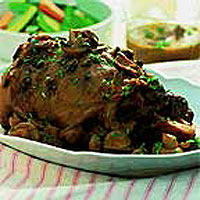 Slow cooking this leg of lamb in a pot gives meltingly tender results, and the mushroom infused juices make a tasty alternative to gravy. Preheat the oven to 180°C, gas mark 4. Place the dried porchini mushrooms in a bowl and cover with 300ml boiling water. Leave to soak for 20 minutes, then strain and reserve both the mushrooms and liquid. Meanwhile, wipe the lamb with kitchen paper and season all over. With the point of a small, sharp knife, make slits in the flesh. Insert a garlic slice and small sprig of thyme into each slit. Heat the oil in a large flameproof casserole big enough to fit the lamb. Add the lamb and fry all over for about 10 minutes, until evenly browned. Remove from the pan. Add the onions and fry for about 5 minutes, until lightly coloured, then add 3 sprigs of thyme, the wine, cep mushrooms and their soaking liquid. Bring to the boil, then return the lamb to the pan and cover tightly. Place the pan in the oven and roast for 2½ hours or until the meat is thoroughly cooked. Remove the lamb from the pan and set on a warm serving dish to rest. Cover tightly with foil to keep warm while you make the sauce. Boil the sauce over a high heat to reduce it by half, then stir in the cup mushrooms and simmer for 5 minutes. Stir in the crème fraîche until dissolved. Taste and season if necessary. Slice the lamb, pour a little sauce over each portion and sprinkle with chopped parsley. Serve the remaining sauce separately.